To me this story is about power – who has it, who wants it, who needs it. Last month we dealt with Krishna and his mother and touched on issues of motherhood. This month the story brings me to issues of childhood. When I was little it seemed like I was in a continuous struggle for power with my mother; a struggle into which I had arbitrarily been plunged without instruction book or reason. Of course I’m describing my feelings – the language came with education and experience and years of introspection and reflection – but I knew instinctively, as all young animals know, that understanding the power dynamics of my tribe was vital to survival. I know now, she did not see me as her adversary. In fact, the struggle I took so personally wasn’t personal at all. Her anger, come by honestly, could not be directed at its proper target and so she turned it on herself and on me. Peas were a huge issue. I hated them, she insisted on serving them. Truly they made me gag. It was the texture more than anything else, but the color didn’t help. In the beginning they were canned. The frozen ones were mildly better though by the time they came around the battle lines were so entrenched no one could back down. On the nights she served peas I often sat in front of am congealing food until bedtime. I devised all kinds of devious ways of folding them up in my paper napkins and then excusing myself to go to the bathroom where I flushed them down the toilet. I stuffed them in my pockets, pushed them into the soft stick of butter in the butter dish, dropped them in my glass of milk, and fed them to the dog who spit them out. He didn’t like them either. Naturally, these stratagems usually failed, resulting in interminable lectures about starving children in foreign climes. The slightest hint of defiance in the form of body language or glances led to high-pitched angry tirades that shattered everyone’s peace for the rest of the evening. It was an extraordinary moment of contrition on her part and forgiveness on mine. It was all that was said. I think we were both shocked. We didn’t talk about my childhood again until years later when I had garnered the courage and experience to be able to initiate the conversation. 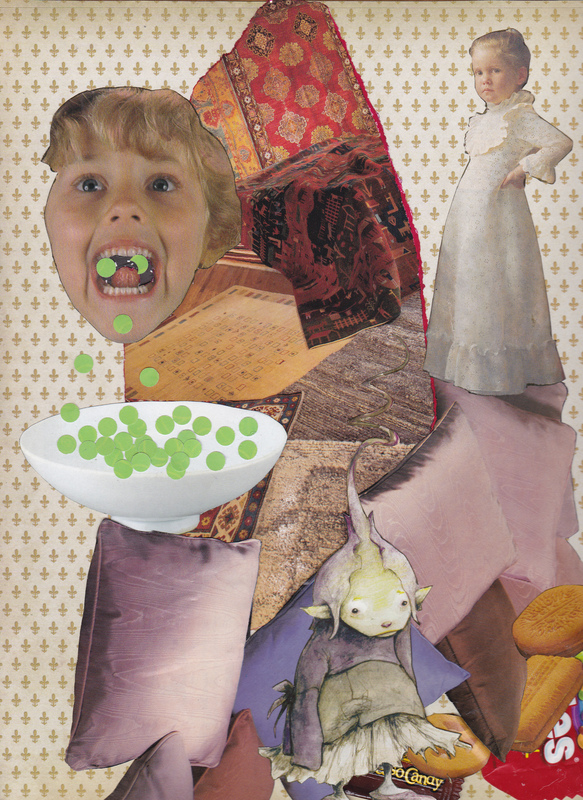 My collage shows a child spitting out her peas – her mouth, like Krishna’s, is full of stars to remind us how precious children are. 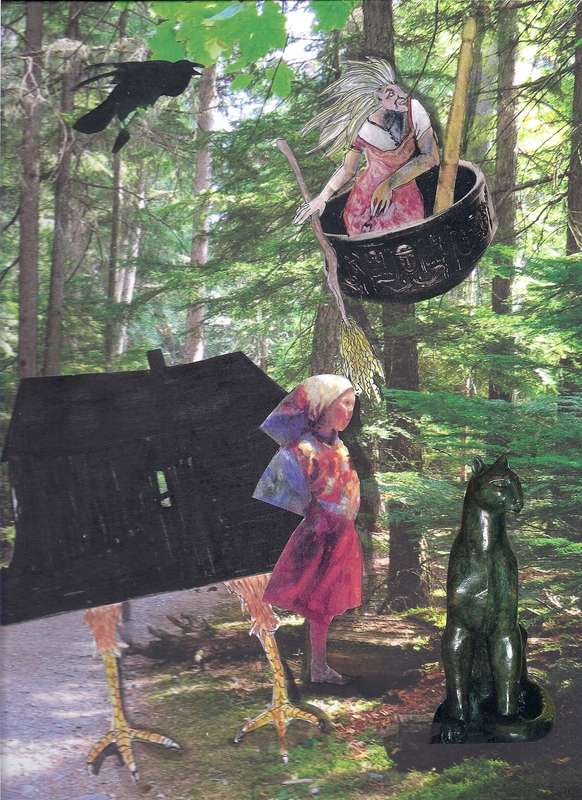 There are two other little ones here – the goblin I thought myself to be and the defiant self-possessed little girl who clung to her own identity and integrity. The fabric in the background refers to the part of this month’s story I liked best – the bed covers and mattresses of many colors. 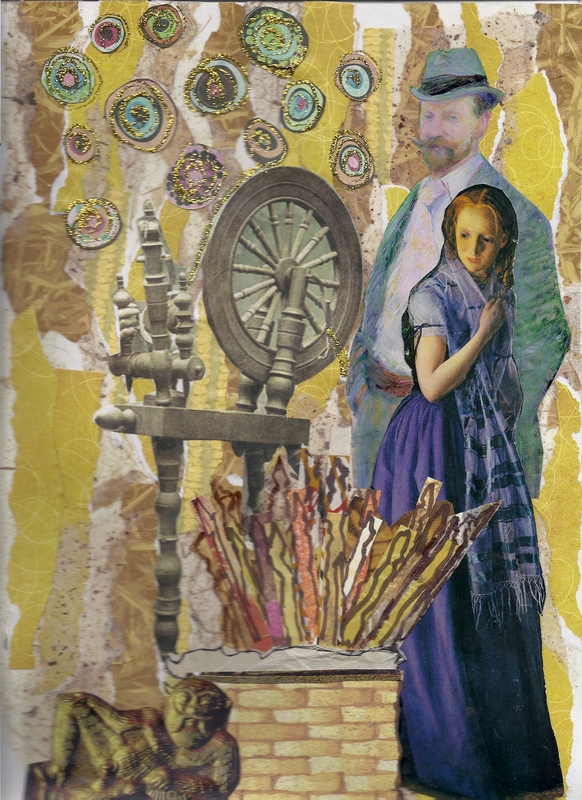 My mom loved fabrics and patterns and taught me to love them, too. My eye for color and talent for composition are part of her legacy. Bed was a special place for me – the place I could be myself, escape into imagination, and read to my heart’s content with the help of a flashlight. It was also my cache. I hid food under the bed. Not peas, of course, stolen cookies and forbidden chocolate made up my stash. You can see candy wrappers and cookies peeking out beneath the pillows. My peas, like the princess’s are like grit rubbing against the soft vulnerable flesh of an oyster. Year after year, I exude nacre to ease my discomfort, working and re-working the raw material of childhood until it becomes a luminous, precious pearl that enriches and enhances my life. The proverbial pea also provides grit in the sense of “true grit.” I’ve found that in my life it is the dis-comforts that make me strong and build my character.